The largest and perhaps the most graceful of the gazelles, Grant's Gazelle differs from others found in Ethiopia both in its size [80-10cm.at the shoulder] and in the considerably longer and stouter horns of the male, which rise up wards and slightly out wards, then curve gently forwards and in wards at the tips, but without the pronounced forward hook of the shoemaking's horns. The record horn length is 72.39cm. [North Kenya race]. The body coloring is place sandy-fawn with white under parts and a white rump patch bordered by dark vertical streaks. A chestnut blaze runs down the centre of the face with white stripes on either side, and there is a black nose spot. 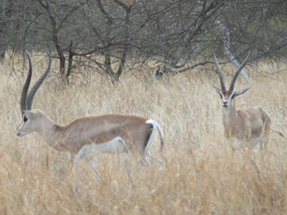 The mature male has no flank marking, though horizontal Grant's gazelles are typically animals of the open plains, where they may be seen in troops of from half a dozen to thirty. In Ethiopia they occur in the Rift valley from Lake Zwai southwards to the Kenya border, in Borana, and in the lower Omo valley to the north of Lake Rudolf.